Therefore, let the godly consider the great errors of the pope’s kingdom and his tyranny. Let them first consider that these errors must be rejected and true doctrine embraced for the glory of God and the salvation of souls. Then let them also ponder how great a crime it is to support unjust cruelty in killing saints, whose blood God will undoubtedly avenge. Even the power of God is seen most clearly in the true teaching of the First Article. It is observed more clearly in salvation through faith in Christ than in any other way. God accomplishes the salvation of human beings through a word, his own word. It does not happen because of our good works or religious services. It comes through a spoken word of promise: his promise, not ours to be better, but his to be our best. Unless we put on the Lord Jesus Christ (Rom 13:14), clothing ourselves in the living Word, forgiveness, justification, and eternal life will always lay far beyond our reach. Acting religious will never do; pretense of godliness is right up there on Paul’s list with pride and unholiness. Prayer: Help me keep the company, Lord Jesus, of those who are in fellowship with you. Amen. 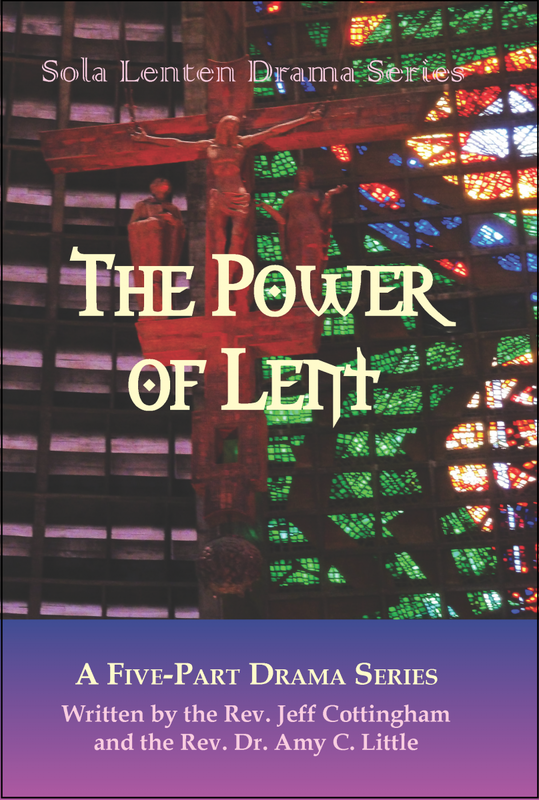 The Power of Lent is a series of lenten dramas pairing two characters each week from the story of Jesus' Passion, bearing witness to what they saw, heard, and felt. 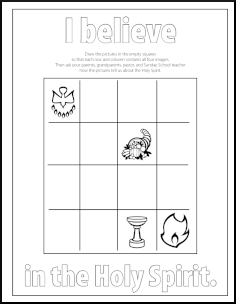 Each pair of biblical characters reflects upon a similar theme for the week, showing how the same events brought about very different reactions to Jesus and his identity. The whole first article of the Apostles Creed, short enough in itself, can be summed up in two words. In the article, Christians confess, “We believe in God the Father almighty, creator of heaven and earth.” The two words are gift and when we pray, obligation. Often enough, the gifts of God in creation are hidden amidst all the demands and duties of family life, jobs, and the requirements of citizenship. Generally, meals don’t arrive at the table already cooked. Though it can happen, children don’t just jump out of bed, eager for their responsibilities. Often enough, work is just that—a seemingly unending flow of things to be done, mixed up in amalgam of boredom and friction. Public life brings with it its own set of apparently unresolvable tensions. But every once in awhile, gifts peek through in an unmistakably gracious way. Young love, an older couple holding hands, a troubled child finally smoothing things out, freshly cut grass, even the sound of a distant train whistle provide reminders that there is something bigger than ourselves at work in things. And then when a sense of giftedness takes over gifts appear everywhere, even in the mundane things that can just as well pass without comment: good coffee, a children’s choir, a solitary whistler. So we pray, among other bids, “give us this daily bread.” As Martin Luther explains in his Small Catechism, when we make such a request we are not just asking for what’s on the table. We are asking that God will make us sensitive to and appreciative of all the gracious gifts with which God creates and sustains daily life. We have to pray for this confidence because the other word essential to the first article of the creed has a way of sounding itself so loudly and continuously that soon that is all we hear. “Get up,” “make your bed,” “don’t forget your homework,” “you have to leave early because of the traffic,” “I want this done before you leave work,” “we can’t get this done without volunteers,” obligations compound themselves until they arrive one after another, seemingly without end. don’t spread. Farmers seed and harvest, milk and muck, so that rest of us can eat. Teachers sit up in the evenings writing lesson plans and endure faculty meetings so that students learn something more than mischief. The gifts of everyday life arise out of the drudgery and delights of labor. The two go together, hand in hand. So the First Article of the Creed requires the second. God the Father almighty sent his son, Jesus Christ our Lord, to put the obligations in their place, to take grace out of its harnesses and let it flow freely in his promises. That’s the Second Article and after that, there is a third, announcing the work of the Holy Spirit in and through you. The fun has just begun. Click these links to download PDFs of the Kids' Pages in Connections magazine. Feel free to include them in your church newsletter, and make copies for use in your church and family. October 31, 1517: The Day Luther Hit the Nail on the Head! 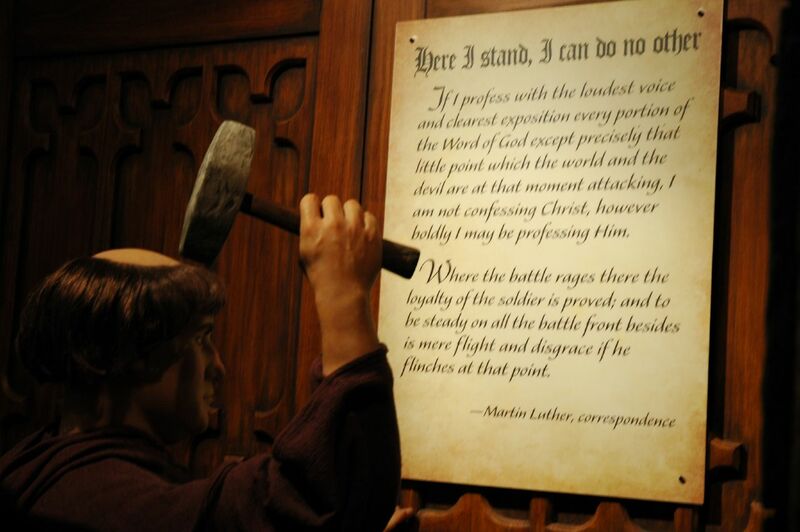 In this year of the 500th anniversary of the Reformation, it is notable that the anniversary is marked by the date that Martin Luther hit the nail on the head, pounding the 95 Theses onto the door of Castle Church in Wittenberg. The anniversary year isn’t marked by Luther’s birthday or by his faithful stand at the Diet of Worms (April 18, 1521), or by the formal presentation of the Augsburg Confession to the emperor (June 25th, 1530), or by the date of Luther’s death (February 18, 1546) at the age of 62. The Reformation’s anniversary is measured from and celebrated on the date that it is said to have begun with the banging of the hammer and the posting of 95 statements for debate. It begs the question: if these 95 “things” were so important as to be the change agent for all of world history, the event that ushered the citizens of the world from the darkness of the Middle Ages into the Modern Era, later tagged “The Reformation”, then shouldn't we know what “they”are? What changes did they usher in? These seem to be obvious and legitimate questions that few pursue. In the small church I now serve, the mid-week Bible Study folks wanted to study about Luther and the Reformation “as long as it is the 500th anniversary.” We’ve been working through a Bible study on the life of Luther, and when we got about halfway through the workbook we arrived at the section dealing with the 95 Theses. There were three short paragraphs and two questions. On the spot, I spontaneously asked the attendees if they wanted to get copies of the 95 Theses and study them. To my surprise, they enthusiastically and unanimously said, “Yes!” It was then that I realized that I really hadn’t studied them. Actually I can remember talking about them a lot and referring to them even more often, but do not recall working through them. I suspect this is true for many teachers and preachers and Lutherans in the pews. These theses marked the anniversary of the Reformation and are what started it all, and yet we know very little about them, other than by name. Unfortunately, I’ve found this is true also of the Bible. Many will talk about it and refer to it, but to actually read and study it is not as common. There are many “coffee table” editions of the Holy Bible that are touched when the covers need dusting, but never opened up to reveal the contents within. Unlike at the time of the Reformation, we can’t hide behind the excuse of widespread illiteracy or that it is all “Greek to me” (and Hebrew). A vitally important aspect of the Reformation was the translation of the Bible into the people’s language so the Word could be read and studied and not withheld from God’s children. The nailing of “the 95” spiked the curiosity of the masses and ignited the newly-invented printing presses. As I began to read and study the theses, I was struck by one major light bulb moment: the recognition of how different Luther’s beliefs and theological convictions were in the writing of these theses from where he ends up in his later years and in our Lutheran Confessions. Here in the 95 Theses, Luther still speaks of purgatory as a reality and does not condemn indulgences but rather their issuance for money and the trust placed in them. Where Luther was in relationship to the institutional church and those who were in positions of authority, including the Pope, is much different here than it will be over the coming years. Luther as a teacher, preacher, theologian and believer evolved from where he was and who he was when he took pen in hand and crafted these theses. It is very important that the teacher of the 95 Theses and the reader are reminded that many of the things discussed in “the 95” are not part of our confessional faith. A constant reminder is necessary that much of this discussion and debate is foreign to what we believe and practice as Christian Lutherans. As “the 95” mark the beginning of the Reformation, so they also mark the beginning of great change — in Luther’s thinking, his belief and his relationship to the institutional church. They mark the beginning of the rising of the masses through increased literacy and education. They mark the change in the power and primacy of the Roman Empire, both as a church and as the state. They mark the beginning of a time of reform that gave birth to multiple reformers and movements, many of which took issue with Luther and his theological convictions. They mark the beginning of a growing resistance against authority figures and institutions. And while we all know that “Rome was not built in a day,” this particular day in history with the nailing of the 95 Theses numbered the days of Rome’s unchecked authority as a church and as an empire. While many say the actual “nailing” of the Thesis to the door of the church is “legendary” and did not actually take place in that fashion, it would be accurate to say that whether Luther had an actual hammer in his hand or not, the proverbial “fan” was present on October 31, 1517 and all the “theses” hit it! To say that Luther was surprised by the reaction would probably be the understatement of the half millennium! It was not his plan to wage war against the powers that be or to incite a riot, or even just to ruffle a few clerical feathers. He drafted the theses in Latin, the language of the church and the language of his academic colleagues. He was basically posting an invitation to other teaching theologians and church leadership to come and debate the problems, as he perceived them. Luther identified the problem as the selling of God’s forgiveness in the form of indulgences with the assurance made to sinners that if they pay the price they can make satisfaction for their sins, or those of their loved ones, either in their present day or in Purgatory. Past, present and future forgiveness of sins granted by Papal decree for a profit was a practice of the church that Luther could not stomach, let alone defend Biblically. A quick perusal of Reformation history should impress upon us that it was the “cha-ching” of the coins in the church coffers, ringing with the promise of souls springing from purgatory, that really turned Luther’s crank. To see the plans for the erection of an imposing, glorious basilica named for St. Peter — knowing that it was funded by the false teaching regarding penance, the dismissal of true, God-invoked repentance and the defrauding of an illiterate population of believers — inspired Luther to start asking “all the wrong questions” from the leadership’s perspective. These were questions that would lead to his potential arrest, a life in hiding branded as an outlaw and heretic, and a price put on his head. So, Luther is a work in progress, traveling in the fast lane! His sending out of an invitation to debate the wrong teachings and practices of the church, in hopes of civil discourse resulting in much-needed correction and amends, was by 20/20 hindsight a bit of a pipe dream. 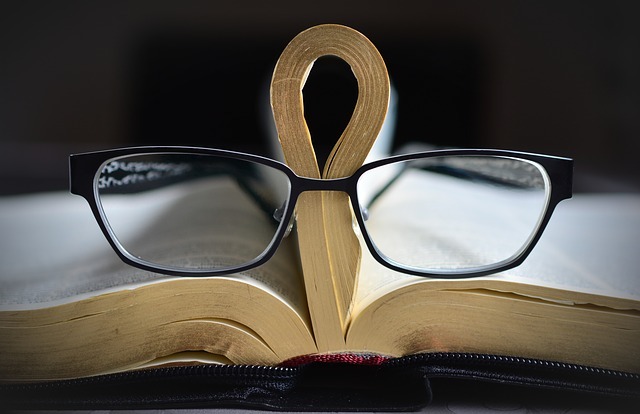 This somewhat naïve, not-so-young resident monk and teaching theologian, inexperienced in the ways of institutional church, got what may well have been the surprise of his life. It had only been six years since Luther had been sent to “Podunk” Wittenberg to serve, and only five years since he earned his doctorate (something he later reflected upon as an act of obedience not something he wanted to pursue.) This Luther — who nailed the Theses that hit the fan, ignited the spark and rocked the world of both church and state — is in a very different place in his theological development and convictions than the Luther who would make his historic stand at the Diet of Worms just three years later. As clay in the Potter’s hands, Luther set off not only a cultural reformation and an ecclesiastical (church) reformation, but he entered into the era of his own personal reformation. 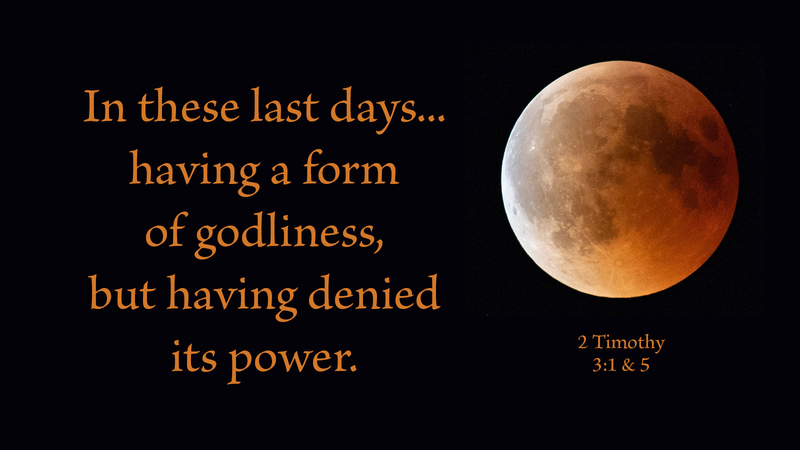 God was forming a prophet for this particular time in the history of His church and the history of His world groaning under the heavy weight of sin. For the church to burden the consciences of sinners and profit from that unorthodox, heretical adulteration of the Word was an institutional rebellion against the cross of Christ that needed to be confronted and corrected by a real live, rough and tumble, straight-talking prophet of German descent. God called Luther into something that he had never imagined possible and for which he did not dream of nor desire. This Luther, standing on the steps of Castle Church, still taught and practiced the doctrine of the Roman Catholic Church. The numerous sacraments were not questioned, the existence of Purgatory was not contested, the categories of sins as moral and venial and acts of penance according to contrition and attrition remained, along with the office of the Pope with its increasing power and authority after the Crusades. Also not yet questioned was the divine necessity of church hierarchy; the teachings of apostolic succession and ordination; the understanding of vocation and the priesthood of all believers; the limitations on the office of the keys; the practices associated with the Lord’s Supper, including the teaching of transubstantiation; the acceptance of other church doctrine that is not Scriptural; the definition of a sacrament; the presence of the “treasury of merits” (which was a supposed account or fund of good works accumulated by Christ and the saints that the Pope could tap into); the prayers to the dead and for the dead; the means of grace; and the understanding of justification as a pure gift from God through Jesus Christ apart from works of the law. While this listing is admittedly exhausting to read, it is not exhaustive of all the huge theological teachings that are not even on the table when the 95 Theses were hung on the door. The Potter had a lot in store for His prophetic clay named Martin Luther, and it is a very good thing that the Holy Spirit had not yet clued him in for what the reaction would be and how far, wide and fast the ripple effect would spread. Behind Luther’s statements runs this thread of concern that true contrition and repentance of one’s sin is not only being cheapened, but cut off for the profit of the church in the sale of indulgences. Knowing the man Luther, just a bit, and how he struggled with his burdened conscience, bouts of depression and a search for assurance and freedom in the face of an angry God, we can see that the ringing of the coins in the coffers bothered him not only because of the profit of the church built on the bent backs of burdened sinners, but also because the peddling of cheap grace that can never be free. A prophet like Luther could never turn a blind eye or deaf ear to such heresy (wrong, unorthodox teaching). Luther is still the one who called out to Saint Anne in the storm, committing his life to being a monk in exchange for his safety. Luther is still the one who later had his “Tower Experience” where he heard for the first time the gracious Word of God as both Law and Gospel. This Luther finally knew the free grace of God (apart from works of the Law), fully accomplished by Jesus’ death on the cross for him. This Luther, drafting the 95 Theses, did not do so as an enemy of the church or as a rebel looking for a cause, but as a freed and forgiven child of God. He wrote, knowing himself to be merely a beggar at the foot of Christ cross — a beggar who understood that the church, for good order, is not to be the stumbling block for repentant sinners but the path of least resistance to our Savior. And so with these words Luther was thrust into the turbulent years of the Reformation, knowing only the peace of God which the world does not understand. This is a message that we of the 21st century need to have ears to hear, loud and clear, as God continues to reform His church as clay in His scarred hands. 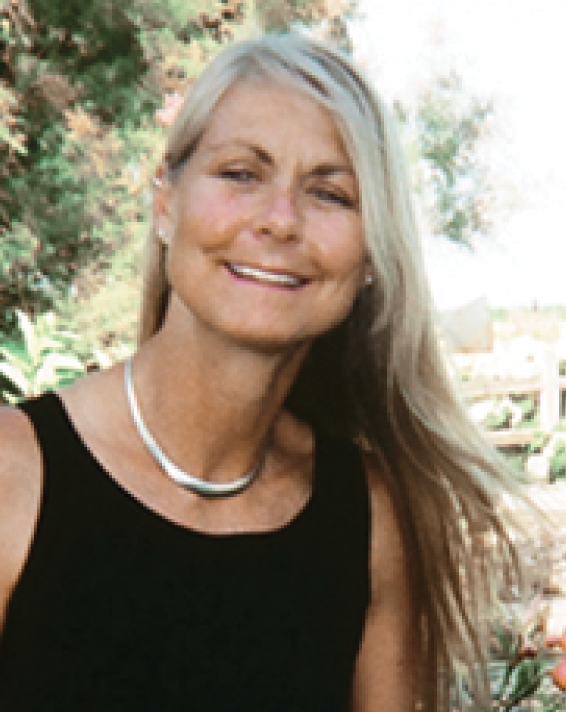 Jaynan Clark is a chosen child of God, mother of four, grandma of one, preacher, teacher, missionary, writer, manual laborer, and known to many as a “tough ol’ broad !” Thanks be to God!